Today on the 29th September, I am thinking about William Baker Tyzack. That was the date in 1866 when he, his wife Charity (nee Juby) and their children Mary Jane (14 yrs) , Thomas William (12 yrs), Henry James (9 yrs) and Maria Baker (3 yrs), boarded their ship ready to set sail from England forever. The family departed from Plymouth in the south west of England a few days later. 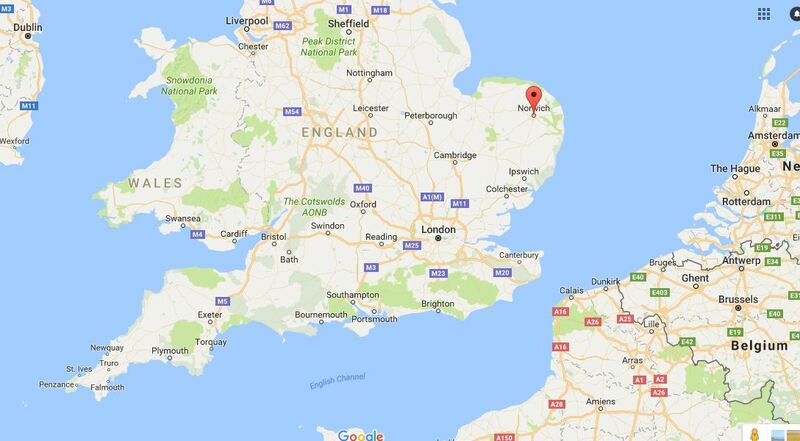 We have no records indicating how they reached Plymouth from their home area in the eastern part of England, a distance of approximately 600 kms. It is difficult to imagine what it would have been like to travel 150 years ago with all your possessions and everything deemed necessary for a new unknown country, plus young children. My guess is they took a Great Eastern Railway train to London, and then the Great Western Railway to Bristol before linking with the South Devon Railway to Plymouth. There were no sleeping cars in those days, so with a presumably tired and fidgety young family, their train journey may have been memorable for all the wrong reasons. I cannot determine how William found money to pay for their travel to Plymouth or the cost of the ship fares. We know that William was declared bankrupt on the 25th July 1864. A little over two years later it seems unlikely he would have been flush with funds. Did his cousin Charles who had travelled to Australia in the early 1850s, provide the necessary monies? The Australasian newspaper on Saturday the 22nd December 1866 provided the names of approximately 42 cabin passengers and then said “and seventy-eight in the second and fore cabins”. That William and his family were not listed as passengers suggests they were travelling cheaply. 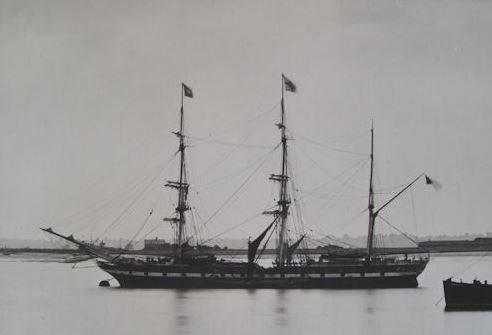 A photo of the Lincolnshire resting at anchor, is shown below. Photo is courtesy of the Historic Shipping site. 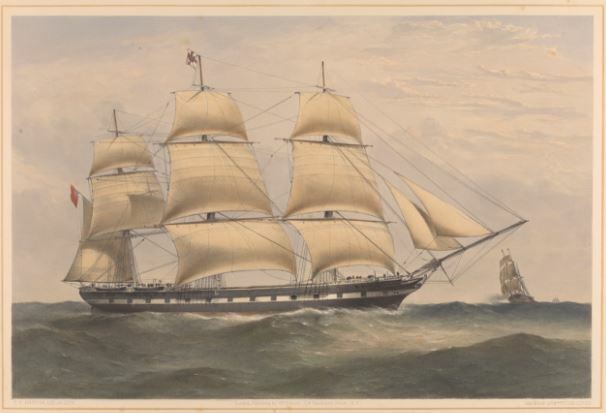 The watercolour painting below of the Lincolnshire in full billowing sail, by artists William Foster and Thomas Goldsworth Dutton, is held in the collection of the National Maritime Museum at Greenwich in London. 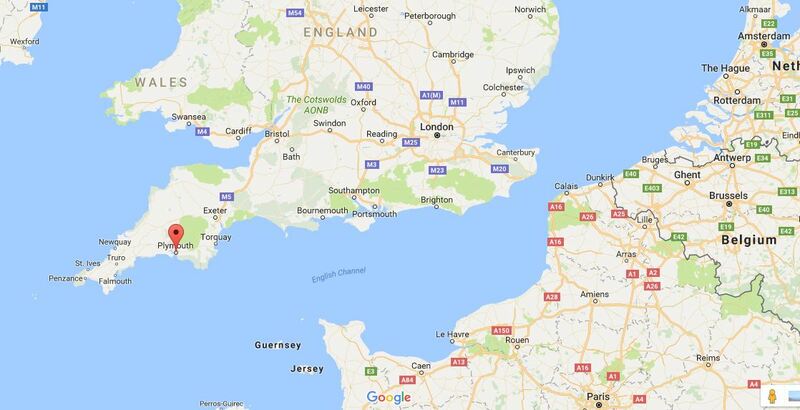 The Lincolnshire set sail from Plymouth, bound for Melbourne, on the 1st October according to Historic Shipping.